A team from the University of Georgia College of Engineering took second place in the 2018 American Society of Agricultural and Biological Engineers (ASABE) Robotics Student Design Competition. The competition was held July 31 in conjunction with the ASABE annual meeting in Detroit. UGA’s performance marks the first time a team from a university in Georgia has captured an award at the robotics event. This year’s student robotics challenge involved identification, sorting, and harvesting of apples. The robots were required to autonomously harvest “apples” on a field measuring 8 feet by 8 feet. The robots identified and selected eight mature apples (red ping-pong balls), removed and disposed of eight diseased or rotten apples (blue ping-pong balls) and left eight immature apples (green ping-pong balls) on the tree. The ASABE competition featured 19 teams divided into two divisions – beginner and advanced. UGA competed in the advanced division alongside China Agricultural College, McGill University, University of California – Davis, University of Florida, and University of Nebraska – Lincoln. China Agricultural College won first place while the University of Florida finished third. 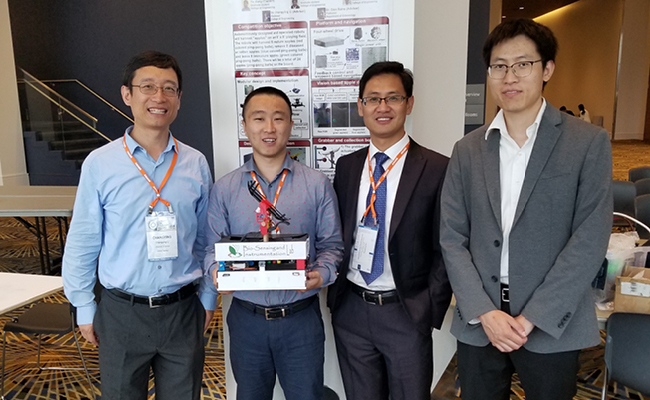 The members of the UGA team were Yu Jiang (captain), Rui Xu, and Shangpeng Sun, all doctoral students in agricultural and biological engineering. The team’s advisors were Charlie Li, a professor in the College of Engineering, and Glen Rains, a professor in the College of Agricultural and Environmental Sciences. Photo above (left to right): Li, Jiang, Sun, and Xu. The team was sponsored by the School of Environmental, Civil, Agricultural, and Mechanical Engineering, AGCO, Inc., and ASABE-Georgia Section. The ASABE Robotics Student Design Competition allows undergraduate and graduate students to develop skills in robotic systems, electronics and sensing technologies by simulating a robotics solution to a common agricultural process.